Can social services actually be ‘designed’? 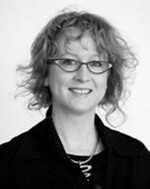 asks Ingrid Burkett, the Social Design Fellow at the Centre for Social Inclusion. “Participatory experience is not simply a method or set of methodologies, it is a mindset and an attitude about people. It is the belief that all people have something to offer to the design process and that they can be both articulate and creative when given appropriate tools with which to express themselves” (Liz Sanders, MakeTools, 2002). Ingrid Burkett is the Social Design Fellow at CSI. Can social services actually be ‘designed’? The design process is about finding solutions to address problems, practical innovations that open up possibilities and improvements that enhance people’s lives. In recent years the design process has been applied to improving services rather than only focusing on material goods and products – this is often referred to as ‘service design’. Service design is also increasingly applied to social services, in an attempt to improve the ways in which these services generate social impact. Social services can indeed be ‘designed’. In fact most social services are subject to some very intentional and deliberate thought processes and design adds another framework around which such processes can be structured. Co-design is about engaging consumers and users of products and services in the design process, with the idea that this will ultimately lead to improvements and innovation. In this blog I’m going to reflect a little on what co-design of social services means and whether it can lead to greater social impact. In the next part to this blog, I’ll explore some key principles of co-designing social services and highlight a few methods and tools. In the social services, there is a long and rich tradition of participatory engagement with so called ‘clients’, ‘consumers’, ‘beneficiaries’ and ‘constituents’ (*see my note at the conclusion of this blog regarding the numerous ‘inverted commas here’). Indeed many social and community organisations in Australia were actually originally designed and started by or with ‘consumers’. Many organisations have also promoted the importance of working in partnership with service users – adopting, for example, ‘person-centred’ or ‘people-centred’ practices where citizens become active partners in the change process. There are many other examples of ‘consumer led‘ or ‘service user led’ movements or organisations where citizens take the initiative and the lead for finding or advocating for solutions to their own issues (for example, those started from the independent living movement in the disability sector). Participation of citizens has been core to many social services and to many traditions of work aligned with social services – particularly community development. Most people working in social services will be familiar with ladders and other models of participation – from providing information on the low end to citizen control at the other end of the continuum (see for example, Sherry Arnstein’s Ladder of Participation). Co-design builds from these frameworks and adds both new approaches and a new imperative for engaging citizens in the design of social services. In recent times there has been a renewed interest from citizens, service providers and policy makers in how all these stakeholders can participate in the design and production of social services. This is generally referred to as ‘co-design’ but has also been called ‘co-creation’ and ‘co-production’ (though some argue that there are definitional differences between these concepts despite sharing the common prefix ‘co-’, meaning together or with). The terms certainly have different histories and have come from different disciplines to be applied to the social sector. However, underpinning all the terms is the idea that collaborative, cooperative and community-centred approaches to creating social good will lead to more effective services and greater social impact. The differences between the terms really centre on the stages of the process at which providers and citizens work together – as is highlighted in the definitions below. Co-Design: “The process of designing with people that will use or deliver a product or service” (Design Council, UK). Co-Production: “Co-production means delivering public services in an equal and reciprocal relationship between professionals, people using services, their families and their neighbours” (David Boyle and Michael Harris, 2009). While it is important to recognise the different histories and trajectories of the movements associated with these terms, it’s also important to appreciate the interconnections between them, and to recognise the much longer histories that concepts behind these terms have both in Australia and internationally. Citizen participation in social services is not new – think about the long history of self-reliance, self-determination, self-help and mutual aid, then think of cooperatives, friendly societies, credit unions and a whole raft of other movements, activism and organisations – to get a sense of the history of these concepts. As well as engaging with the ‘new’ forms of citizen participation that co-design brings, we would do well to explore the many learnings that come from these ‘older’ forms. Why is co-design of interest to people concerned with social impact? Internationally there is growing recognition of ‘user-led’ services and advocacy, where people directly experiencing exclusion are taking action and organising responses to their own situations. 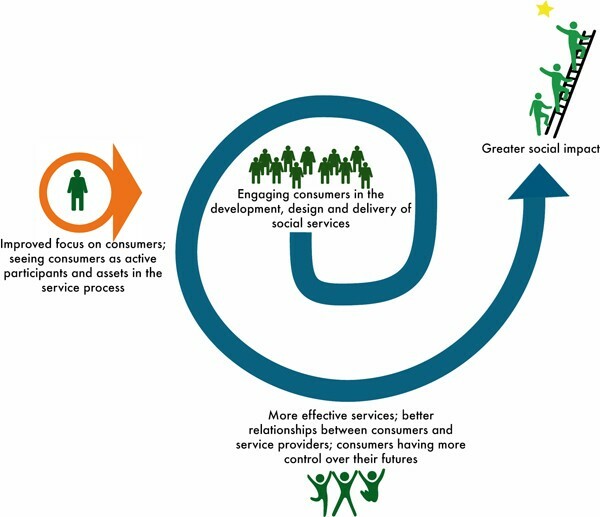 From this perspective, there is a growing demand by consumers for direct involvement in all aspects of service design and delivery (as can be seen in peer-to-peer initiatives (see for example P2P foundation); and various consumer movements (for example, the carers movement; consumers in various health and mental health arenas; self-determination movements and independent living movements, to name just a few). The growth of social media is likely to lead to further developments of citizen led advocacy and service design, and citizens may indeed more actively engage in communicating their experiences of social services over time. The professionalisation of the social sector over recent decades has meant that citizen participation has sometimes become tokenistic, and terms such as ‘partnership’ are used without real engagement of people experiencing exclusion. Citizens are more likely to be ‘serviced’ rather than being active co-creators, let alone co-designers or co-producers, in the process. Co-design can potentially form a foundation in social services for exploring a re-engagement of citizens. Of course it is also the case that in various international contexts the ideals and ideas of greater citizen participation are being widely adopted (as is the terminology of co-design and co-production) alongside the dismantling of public and civic services. There are some important debates to enter into here to highlight the differences between self-service and co-production or co-design. Does co-design lead to greater social impact? This is, of course, the million dollar question. Does involving and engaging people in developing, designing and delivering social services actually create better services and thus lead to great social impacts? Does the scenario for co-design in social services look similar to that indicated by design research in business (with greater social impact replacing greater market share and profits, as indicated in the diagram below)? My own experience working in the social sector, stories and case studies from around the world, and the amount of literature focused on the benefits of citizen participation in social services would certainly suggest that this is the case.And of course, in my heart of hearts I believe that the proposed benefits of cooperative approaches to service development, design and delivery ring true – I mean, it just makes a great deal of sense when we think of how important it can be for each of us to have a feeling of control and choice in making decisions about our own futures to suggest that the same would apply to people experiencing social exclusion. First, there is a real gap in research that tracks outcomes and impacts of involving users in the design and delivery of services. Second, and partly due to the lack of research, the literature offers less certainty than I had hoped for. Generally there is support for co-design, but there are also some mixed results. “The true effectiveness of these processes to promote user-led change and impact on service improvement remains largely untested” (See Sarah Carr’s work on user-led services in the UK, 2004 and 2008). In addition, research in this space comes from widely differing parts of the social sector – health; crime; poverty; aid and development to name just a few – and it is well nigh impossible to say that citizen participation is always more effective across all these disparate parts of the social sector. Finally, there seems to be little focus in the research on the effects of the depth, quality or nature of citizen participation in social services – meaning for example, that there is little evidence about whether participation by more people, or deeper participation by a few key people, is more effective. It is, of course, a complex picture. While I am a firm believer in the power of case studies and stories to support change, I also wonder whether we should, in engaging with agendas of co-design, support some further research into whether and if so, how, it actually drives greater social impacts. This would, I believe, not only help to create a foundation for broader applications of such processes, but also help us to better understand whether, how and why professionals and users of social services should work together in the change process. *As you can guess from all these inverted commas, one of the issues at the heart of these traditions is the language we use to describe different stakeholders in the process of creating social good. I personally prefer active terms such as ‘citizens’ or ‘constituents’, but even these create problems on the other side of the coin if we refer to ‘providers’ as though they are not themselves citizens! For consistency, I’m going to refer to ‘citizens’ or ‘service-users’; and to ‘professionals’ or ‘providers’ for those people delivering services. Some readers may vehemently disagree with this terminology, but I hope we can look beyond language to the spirit of the argument too!